Are We on the Brink of Financial Disaster? Do you know that actually millions who say that they believe in Christ, who have as they claim and as they believe, received Christ or made their decision for Christ have no salvation at all? Because very few even know what is actually meant by that word, 'salvation.' Millions have been deceived and they don't know it; they're honest, sincere people, they think they're right, they think they are as they say, saved. And yet they have no more salvation, my friends, than a guinea pig because millions are deceived today. So listen; almost no one understands what Christ meant when He said, as quoted in Matthew 24:5: "Many shall come in my name [He didn't say few], many shall come in my name [that is, they come as ministers of Jesus Christ, they come in the name of Christ, they come saying they're Christians], come in my name, saying, I am Christ [yes they come and say that Jesus is the Christ, they profess that He is the Messiah]; and shall deceive many" (Matthew 24:5). The many are coming in the name of Christ, as Christians and yet deceiving the many. Not very many believe that this world, this Christian-professing world has actually turned to fables and turned away from the Bible and yet professes Christianity and calls it Christianity. You know, a world famous young evangelist was a guest of Generalissimo Chiang Kai-shek and his wife over in Formosa. The setting was ideal for polite chit-chat but the chit-chat turned into a theological discussion. Sitting across the table from Madame Chiang, and you know Madame Chiang Kai-shek and Generalissimo Chiang Kai-shek professed Christianity. Now, sitting across the table from Madame Chiang at the Presidential Palace was her husband the Generalissimo, once ruler of the biggest nation on earth. United States Ambassador Karl L Rankin was at one end of the table and his wife at the other. On each side of Madame Chiang were this very noted young evangelist and his music director. Chinese food was being served and for a few minutes there was a hum of conversation among the guests. Then Madame Chiang began asking questions; most of her questions were directed at this young evangelist. The hum faded as everyone strained to hear the conversation between two of the world's most famous people. One of the first things that she asked was: "Are people saved who make a decision for Christ and then backslide?" The evangelist answered: "If the decision was genuine, I believe the Bible teaches [notice, I believe the Bible teaches; my friends I know what the Bible teaches], I believe the Bible teaches that they are saved. But if a person has sincerely received Christ into his heart he isn't going to stay a backslider long," said the evangelist. The next question Madame Chiang asked was this: "What about people who have never heard of Christ, when they die will they go to hell?" One person at the table replied immediately; "They're lost." Madame Chiang countered, "I don't believe that." This great young evangelist said: "I don't believe any man can set himself up as a judge and say whether these people are lost or saved. I think that rests in the providence of God Almighty." In other words, he did not know the answer. I'm going to tell you how you can get the answer if you want to know because you can know my friends. Well, to continue now and conclude, after the guests left the table and retired to the drawing room, Generalissimo answered a few questions through an interpreter. A faithful reader of the Bible, he said that his favorite passage was the twenty-third Psalm. I have once before, or two or three times before as a matter of fact; I have quoted one thing that Madame Chiang Kai-shek said that I thought was really very, very good and that all of us could learn a lesson from. It was what her mother taught her about prayer; and apparently Madame Chiang Kai-shek's mother was the one who knew the Bible the best. She had taught her this: when most people pray they say to God: Give me this, give me that, God I want you to do this for me, I want you to do that. They expect God to jump at the crack of their whip. But Madame Chiang Kai-shek's mother had taught her when she prayed to ask God to reveal to her what was God's will and help her to understand what God wanted her to do rather than to try to tell God what she wanted God to do. And you know, that's pretty good advice. However, you'll find that in the Bible there are thousands and thousands of promises — well I don't know whether it's so many thousands, yes, there are several thousand actual promises in the Bible and God expects you to claim those; God says that He will supply all your need; God says and promises that if rely on Him and trust Him, if His Word abides in you and you abide in Him you can ask what you will and — that is, according to His will always because if His Word abides in you, you wouldn't ask anything else. And that, "...whatsoever we ask of him we receive because we keep his commandments, and do that which is right in his sight" (I John 3:22 paraphrased). Now if we're in that condition — and there are conditions — we may ask God for any one of these thousands of things that He has promised us and we can know that we can have the answer. However, many ask and they "...ask amiss, that they may consume it on their own lusts" (James 4:3). So the great many don't know how to pray. But Madame Chiang Kai-shek's mother gave her some very, very good advice. But my friends, here was a man that didn't know what's going to happen to people who never heard of Christ when they die. Did you ever think about that? What about the people who have never heard of Christ and there are millions; now why did Madame Chiang Kai-shek ask that question? I'll tell you why, because there are more people in China who have never heard of Christ than any other nation on earth. And the next most populace nation where millions upon millions have never heard of Christ is India. Do you know my friends that there are hundreds upon hundreds of millions of people who have never even heard the name of Christ? Now my Bible says, and this great evangelist could have known this if he knows his Bible, instead of just knowing what the theological books teach and what he learned in theological seminary; if he had really studied the Bible he would have known that the Bible says: "... there is no other name given among men under heaven whereby men may be saved" (Acts 4:12 paraphrased). There is no other way of salvation. And Jesus Christ Himself said He is the door and if anyone tries to climb up and get into the kingdom of God by any other method except through the sheepfold, the main door to the sheepfold, that man is a thief and a robber and he will never get in (John 10:1 paraphrased). And he should know too that the great and the popular road Jesus Christ said is leading to destruction and many there be going in thereat, the many are deceived. But the straight and the narrow where the narrow gate and the hard, difficult, rocky straight road; that is the road that leads to everlasting life and Jesus Christ said few there be that find it (Matthew 7:14 paraphrased). Now, if you want to know the answer to this question, I didn't intend to go into that in this program and I'm not going to take the time. But those people who never heard of Christ when they die, do they go to hell? Or do they go to Heaven? Or what happens to them? If you want to know the answer to that I have a booklet that'll give it to you. You can know, you don't have to say like this evangelist did that 'I just don't know, I think it rests on the providence of Almighty God.' I have a booklet that'll show you where you can find it in your Bible and believe what the Bible says — not necessarily what my booklet says — I don't ask you to believe that. I ask you to open your mind — now this is quite a shocking booklet, it's pretty strong meat and if you can't take good strong meat and be debunked a little bit on some of the superstitions and some of the fables that have been embraced and accepted by the mass of humanity why don't write in for it because this is good strong meat. It's a booklet called 'Predestination.' 'Predestination.' Now you probably have wondered a lot about predestination. Are some people predestined to be saved and others predestined all in advance to be lost? Has God already set the dye before you were born as to whether you're going to be saved or lost? If so my friends, you haven't got anything to say about it, now have you? 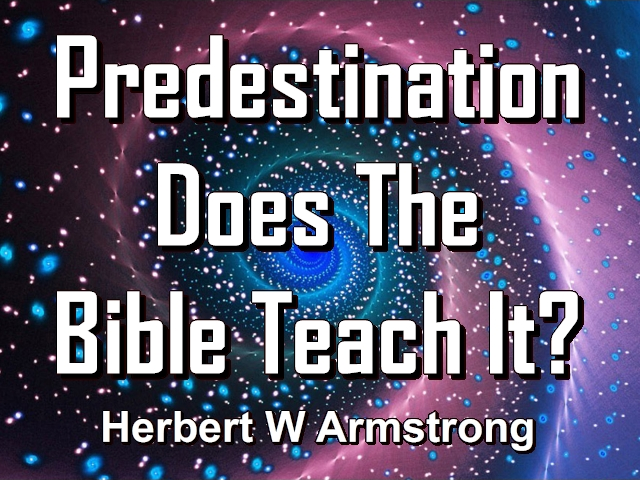 All right, I think that's something a lot of you would like to know about, that's been a question that very few have understood and if you want to understand it write for that booklet on 'Predestination.' Now you'll have to request that by name, don't ask for a booklet I mentioned on this broadcast, I won't remember what it is. But you ask for the booklet called 'Predestination.' You must write that name down in your letter as you request it. Remember, if you want that booklet on 'Predestination,' I don't announce that very often, I believe it's probably been, oh, six months or perhaps a year since I've even mentioned it to you on this program but I think we still have a few thousand copies on hand, if not they'll print some more. Alright, now I read what some great evangelist says, and then if I get one conception, of course, of what salvation is supposed to be; if I read what he says, or hear what he says, and believe what he says of how one is to be converted. People have been taught falsely my friends that Christ completed the plan of salvation on the cross when actually it was only started there. He only began it there. Now this popular belief that some people have that they say just believe, that's all there is to it, all you have to do is to make your decision for Christ, or to profess Christ or to accept Christ and you are already automatically saved. My friends, that teaching is false. And because of deception, because the true gospel of Jesus Christ has been blotted out oh, these 1900 years by the preaching of a false gospel about the person of Christ. Now listen, you hear a gospel about Christ, you hear people exalt Christ, you hear them talk about Christ and His life and His lesson and all of that sort of thing and you believe that's the gospel of Christ. The gospel of Christ is Christ's own gospel, the gospel that He preached not a gospel of men about His person! Now, again if I hear what hundreds, even, yes even thousands of religious leaders say, who come in the name of Christ and who call their religion Christianity and say that they are ministers of Jesus Christ, well, I get about the same idea. An idea by the way which most educators, scientists and intellectual leaders scoff at as a superstition. Now why, why should they? It's the common, popular generally excepted idea of Christianity and of salvation and what it is to be saved and how you get saved. I'm going to put it in a little plainer language than I think they would state it and I think they might think this is well, they wouldn't state it in this language, they might think this isn't complimentary because it makes it so plain for what it is. But most of them believe this: Here we are, and they think we are already immortal, they think we already have eternal life, we don't need God's gift. You know the Bible says "...the wages of sin is death, the gift of God is eternal life" (Romans 6:23), and you have to get it as God's gift. Now they believe I think that you already have it anyway, but that you are automatically separated from God because of one or two things; either from Adam's sin or because you have sinned, and most of them will tell you, of course that, "...all have sinned and come short of the glory of God" (Romans 3:23); and perhaps they do believe it's your own sins that have cut you off from God. But they believe that death doesn't mean death, nothing seems to mean what it says in the Bible. D-E-A-T-H — death seems to mean separation from God. And while you live eternally, in other words, instead of death it means eternal life. Now eternal life is what you get from God, not what you already have. And you are separated from God that's true but that's not the penalty, being separated from God; you're already separated from God and the penalty is death, and that death is for all eternity, there will never be a resurrection from that death because that is the second death in the lake of fire. That's the only hell-fire Jesus Christ talked about and it's a lot hotter than most people think because no one is ever going to be resurrected from that death. That is for all eternity. The punishment is death, the punishment is not separation from God, you already have that, that isn't your punishment. You've got another punishment coming later for being separated from God and the punishment is death and it's for all eternity and therefore it is eternal punishment. Yes, I believe in eternal punishment, don't you ever dare say I don't, because I do believe in eternal punishment, but my Bible says that the punishment is death. Romans 6:23... the punishment, or, "the wages of sin is death; but the gift of God is eternal life [and that's only] through Jesus Christ our Lord" (Romans 6:23). And I have been telling you the last two or three days if you don't have Christ living in you by His spirit, and it's just the same as if He was living physically or bodily in you, if His Spirit is living your life for you; then my friends, if Christ is in you, you have the presence of immortality. Because Christ only has immortality and if He is not in you to impart it to you, you do not have immortality. Well, as I said, I hear what hundreds, even thousands of religious leaders that profess Christianity and come in the name of Christ and say 'I am a minister of Christ' and what they say, well I get one idea. Yes, it's a popular idea, it's what most people who believe in Christianity, it's what they have always heard is Christianity. And still it's what the intellectual people of this country really look on as a superstition; scientists, educators, intellectual people and leaders. But listen my friends, when I look into the Bible instead of listening to men and reading what men write; when I see what God wrote and listen and look in the Bible and read what God says, I find there a diametrically opposite truth, yes, a truth. And it's a plain truth, it's so plain a child could understand it and it is no superstition. It makes sense. It is rational. Now I have explained what the Bible says to many an educator and a scientist, or I shouldn't say a scientist, scientists in the plural because it's many of them. And I have never yet found one that can refute it and every single one without question that I have explained it to, and I mean people that are not Christians, I mean people that have scoffed at what is popularly known as Christianity and when I explain to them what the Bible says, well, they are just dumbfounded and they say, "Well I have never heard anything like that before." And they will always say, "Well now that makes sense." I'll tell you the truth, I don't know of a one of them that has ever accepted it. Do you know why? Because it's going to cut right through their pride. It means they're going to have to absolutely surrender to God; it means they're going to have to repent of their sins; they're going to have to admit they're sinners and they're going to have to be conquered by God. And those men have too much intellectuality, they are too proud, they have too much vanity, they are too well aware of their intellectual powers and abilities and their education and they're too steeped in their education to ever surrender, to ever humble themselves and to ever repent of their sins and accept Christ as their Savior. Now there are two things you have to do to be converted. One is you have to really humble yourself, you have to repent, you have to really be conquered, make an unconditional surrender to God so that you're willing to live by every word of God and let God's word the Bible, correct you, reprove you, let God chasten you and punish you as He does every son whom He loves (Hebrews 12:6-8). And you're going to overcome your own self, you're going to realize that you yourself are your own worst enemy — the only real enemy you've got, unless it might be Satan the Devil but you don't really have any other human enemy in the real sense, most of you don't anyway; and anyway, your worst enemy is your own self. That much I know is true of every one of you. Now, what is it then to be converted? What does this word 'converted' really mean? Becoming converted means being changed. And when one receives the Holy Spirit of God his whole viewpoint, his outlook, his purposes, his goals, his ways of thought; everything becomes changed. How do you receive the Spirit of God? You have to recognize my friends that you are carnal and it's human to err and to sin and we all have. And I know a lot of... these people that are deceived, they're honest, they're sincere, sure. But my friends, every one of us has been wrong, we've been on the wrong track. And it means to repent. It means to thoroughly repent of that and to really be conquered by God Almighty. "Repent, every one of you and be baptized in the name of Jesus Christ for the remission of sins and you shall receive the gift of the Holy Spirit" (Acts 2:38). That's God's promise. Now listen, I did mention that booklet on 'Predestination.' Alright, you have to write down that name — Predestination. Now here's another one you have to write down the name if you want it. 'Why Were You Born?.' I think of all of the booklets that we have written, that we've published that I've been announcing on this program for years and years, that there has never been one more important than this. This lays down before you the whole purpose of life. It lays down the whole of the whys and wherefores of this thing that we call Salvation; why do we need it, and just what is it, what do you get and how? Why does God permit wars and so much human suffering, heartache, fears and worries and all this type of thing. Empty lives, why does God allow such suffering in this world? And what is the purpose being worked out here below? You know that mankind seems to have failed utterly to understand, he has lost his way, he has lost sight of the very purpose of life. And yet there's a reason why, not only why the world was put here, not only why God put mankind here in general; but listen, there is a reason why God had you born as an individual. There is a reason why you as a person, as an individual were put here on this world and most of you don't know what it is and you're failing to realize that very purpose. Now naturally, it has to do with the plan of redemption. But even that plan is not very widely understood today nor rightly preached. As a matter of fact, very few understand the plan, very few understand the purpose. Very few understand what redemption is, what salvation is, where we go, what is the condition, what are the terms, how do we get there, why do we need it; all of those things. You know we should ask and we should understand. Why does man need any redemption anyway? Why do we need it? And what is it? The popular teaching is that one is saved at the time he accepts Christ as personal Savior or when he professes Christ or makes his decision for Christ; or in some churches, when he is baptized or when he joins the church or whatever the way of initiation might be. Well then listen my friends, I'd like to ask you this, I want you to think about it. Why is it then that God does not right then and there in that moment remove a man if he is already saved and if it's all finished work and that's all there is to it. Why does not God right then and there remove the saved Christian from this unhappy world of suffering? Why does he have to go on and suffer? Why not take him immediately to his happy reward? Why, if he is saved must he live on in this life of suffering. And why is it that we read in the Bible that of the man who is really converted now, a righteous man; it says many are the afflictions of the righteous as well as the unrighteous. Although it does say that God delivers him out of them all (referring to Psalm 34:19). But why should he have these afflictions in the first place. And then again you read in the Bible; "All who will live godly in Christ Jesus shall suffer persecution." (II Timothy 3:12). If you are not suffering persecution you are not living godly in Christ Jesus, you are not really a Christian. You certainly have no salvation according to the word of God. But why should that be? Why should that be? And then again we read; it is "...through much tribulation we must enter the kingdom of God" (Acts 14:22). Why? Why doesn't God take a person immediately to his reward and remove him from all of the pains and the heartache and the suffering of this world if he is then and there saved? Why is there such a thing as sin? Why? Now we hear that it came from the original fall of man. Well do you understand about that original fall? Was there any original fall after all? You know my friends, we've heard about it, we take it for granted but did you ever look into it? You will if you read this book — it will explain it; it will explain all about it. Now this is a booklet my friends that, well you just can't understand about life, you can't understand about salvation, you can't understand God's purpose unless you understand what is in this little booklet. I think, as I say that we have never put out a booklet more important to you than this. Now listen, many of you are on the mailing list to receive the Plain Truth magazine. Well, you won't receive this booklet unless you ask for it specially. You have to write in separately and specially and mention it by name. The name of this booklet; 'Why Were You Born?.' Now jot that down immediately. Now the other booklet; 'All About Water Baptism.' just write in for the booklet on water baptism. Now this booklet — a very attractive booklet — explains the way of salvation. Completely answers the question; is water baptism essential to salvation? It explains the way of salvation; it explains about the thief on the cross; was he saved without water baptism? Now he had no opportunity to be baptized in water. Could he be saved without it? What is the proper form, mode or way of baptizing if it is now in force and effect and a condition to salvation? Is it sprinkling, is it pouring, or is it immersion? And then this question, should babies and children be baptized. Do you really know the answer? Until then this is Herbert W Armstrong saying, "Goodbye friends."